BEFORE HE EVER LIFTED HIS MIGHTY HAMMER...Fantastic journeys beckon from the mysterious nine realms. Places of dark mists and fiery voids. Of winged creatures and giants in the ice. And of the most alluring quest of all -- the search for the legendary Lost Sword of Surtur. 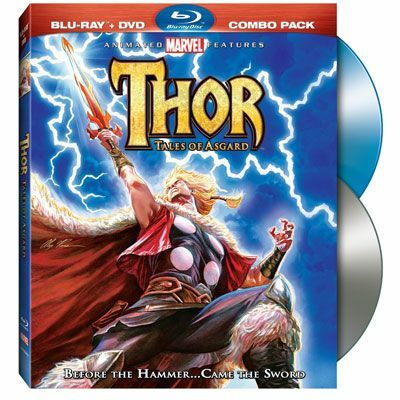 Hungry for adventure, Thor secretly embarks on the journey of a lifetime, joined by his loyal brother Loki, whose budding sorcery equips him with just enough magic to conjure up trouble, along with the Warriors Three -- a band of boastful travelers reluctant to set sail on any adventure that might actually be dangerous. But what starts out as a harmless treasure hunt quickly turns deadly, and Thor must now prove himself worthy of the destiny he covets by saving Asgard itself. Other products for "Mighty Thor" in "Accessories"
Other products for "Mighty Thor" in "Character Goods"
Other products for "Mighty Thor" in "DVDs"
Other products for "Mighty Thor" in "Figures"
Other products for "Mighty Thor" in "Key Chains"
Other products for "Mighty Thor" in "Stationery"